○ Current Name: Masami Otsuka. ○ Actual Name: Mukushiki | Amalavijñāna. ○ Alias': Tōjū [刀獣, Sword Beast]. ○ Age: Chronologically: 1800 years old; Physically: Early Thirties. ○ Race: Zanpakuto Spirit [Independent]. ○ Association: She is a free spirit. No pun intended. While she wanders the realms and follows her own path. She prefers a free lifestyle where she does her own thing rather than be chained down to responsibility. While she is not opposed to the idea given her past she can be sceptical and take a while to warm up to a person. Has a large tattoo of the kanji for nothingness on her back. Masami is a being that wants to carve her own life and path. She is not like other zanpakuto spirits where she has to rely on a shinigami and have a bond after the one she held previously with her former master Sasaki Watanabe. She is a strongly independent character that doesn't want to be dependent on others. Masami is the kind of person that when you meet leaves a strong impression but you quickly forget when she leaves. It's nothing special about her but she's not the kind to settle down and be with you very long unless you're truly special. She has a soft spot for children and people that appear quite young, this ends around the age of twelve for her but she is very affectionate and motherly to them. Her feelings towards children compensates for her desire to raise children but the acceptance that she won't ever be one even if she could possibly have them. She is after all a zanpakuto spirit and she doesn't believe that for her to be children would be natural or in any way acceptable for her, even if presented the opportunity with another zanpakuto spirit to have a children she would never be okay with it because that's not what a zanpakuto should be doing. Despite acknowledging what she is she doesn't feel like she is that anymore. Being without a master and the way that ended has given her the idea that she has thrown away the title. She feels she is more suited to be called a "Tōjū" stemming from the name given to her by the shinigami all those years ago. In essence she holds herself to the same standard as other spirits but does not consider herself to be the same as them anymore. She behaves like a teacher, imparting what knowledge she might've picked up on her travels into people before leaving once again with the wind. Her attitude though is quite old fashioned and having lived so long she is quite stubborn to changing her mind. Once she has it her way she becomes incredibly dogmatic and difficult to reason with regardless of how polite she can be about saying no to you. Once upon a time Masami had a much different life, she is a zanpakuto after all. That meant that she was born from a shinigami imprinting on an ausachi. That is how the zanpakuto Mukushiki came to existence. Her master was a brilliant one, a young man with excellent potential that had the instructors hoping he would become an excellent captain one day. He was a bit awkward though, never really fitting in around others or getting along. The man known as Sasaki played nice with everyone but dedicated himself solely to his own improvement unfortunately. Having all this spare time and only putting the effort into himself he started going into advanced levels of the shinigami arts. Taking up his zanpakuto and jinzen is how Mukushiki slowly became aware. It would be the time she was born in a sense. Despite all his work the Sasaki put into his training he wouldn't be able to so much as make it to his inner-world in the few years he spent at the academy. Post-graduation Sasaki entered the sixth division under Ginrei Kuchiki. The process repeated, he remained reclusive except for when he had to work with others for his duties. Anymore time he would waste on them was it. He kept up with jinzen and eventually Mukushiki would be seen. The tranquil field that was the inner-world of Sasaki. She could never understand where it came from since her master always seemed so distant, worried even about things and paranoid of others. For an inner-world it did not reflect her master really. He was able to hear her voice and she was able to hear his. Unfortunately he wasn't able to hear her name though no matter how hard she tried to say it to him. Even shouting it at him once before giving up. After a few months of this and interacting with him she was finally able to give her name and bestow shikai onto Sasaki after three years of being in the sixth division. Not noticing it immediately he would spend a large amount of time in his inner-world with her. His free time and breaks would be consumed just inside his head with her. Mukushiki didn't feel it was her place to confront him or challenge him about it. She was his zanpakuto after all and he was her master. That was their relationship to her. For Sasaki it wasn't though, the man came to rely on her too much. She had became essential for his inner-peace that he had become obsessed with her. He turned away from reality more and more over the next weeks until he even began failing in his duties. Going onto the physical plane with her abilities Mukushiki manifested to try and get him to have some help. It had the opposite effect however, finding out about her ability to manifest he wanted her to remain this way permanently. She did not like it but accepted it as her fate. After sitting back and watching him slip away she snapped and challenged her master on his health and vented her concern. In return for her concern and worry she received a beating from him. Their relationship had changed and she blamed herself for all that had happened to him. When the time came that he snapped completely and confessed a love for her and a desire to produce a family with her she couldn't. That was not right and a disgusting thought. Responding the same way he did the last time she challenged him Mukushiki killed him while he was trying to force himself onto her. After that she expected to fade away, having not realised her powers residing over balance made her able to sustain herself without a master she cried at realising what she had done. When a shinigami came along and saw the scene of Sasaki's butchered body and his zanpakuto still manifested holding it the scene would become twisted. No one understood the true events and Mukushiki was forced to flee. Creating a small shinigami folktale about the situation about a shinigami being betrayed and murdered by his own zanpakuto which lived on as a toujuu. Such was the title she adopted for herself and an identity assumed. She became Masami Otsuka and no longer a zanpakuto spirit in her eyes. Following the fateful events she fled to the human realm and became a wanderer, varying between the Human World and the Rukongai through small passages between realms or hitching a ride with a shinigami through a senkaimon. ○ Pseudo-Shinigami: Masami is a zanpakuto, through and through. She is a manifested spirit that isn't reliant on a master. Now she is not a shinigami yet can mimic the attributes of her master. After all if a zanpakuto spirit uses reiryoku, conveniently a shinigami uses it too, there are no reasons as to why she could not mimic the use of Kido and use of spiritual energy. Do to her status as a zanpakuto spirit her energy has a different feel, it is for all intents and purposes a shinigami's to the novice sensor but towards the higher tier sensing skill they can identify the minute fluctuations in the nature of her energy which alludes to her true nature. 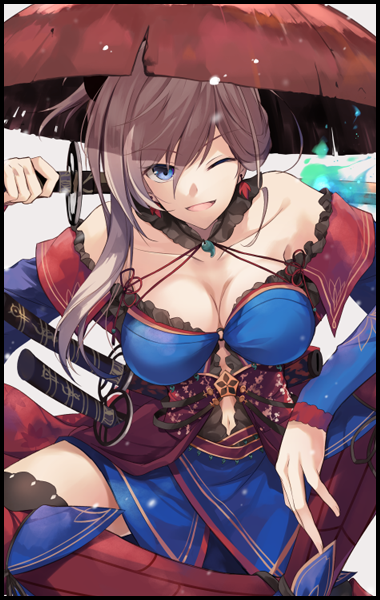 ○ Natural Sword Master: In terms of her skill with a sword there is nothing more natural to her than wielding one. Wielding a sword to her is like knowing how to walk. When it comes to handling herself as a zanpakuto she is incredibly fluid and able to use herself without issue or any form of unfamiliarity with it. This passively extends towards other weapons of the sword shape. She is able to pick up a sword and after a very short period she is able to use it as if it were part of her. Adusting for weight and aspects of the blade. You might say it instinctively feels as if it becomes an extension of her body when she uses it. ○ Weapon Intuition: In the very essence of her existence she is a weapon at heart. There is an empathetic connection that she shares with the concept of "weapon". An example of this is by holding someone's zanpakuto she can instinctively learn one's name, the same can be said towards any weapon which is unique. Just a name is enough to distinguish two completely exact swords. Even the asauchi, they themselves need to be identified by something even if that means a serial number. Masami is able to draw out this name and become aware of it. There is very little benefit to this though with the exception of maybe being able to distinguish a theme to the weapon from the name if she thought about it but at the same time the name can be completely irrelevant to what the weapon does which would give her a false sense of it anyway. ○ Sword Body: Naturally as a zanpakuto her physical manifestation has traits relating to her true nature. She boasts skin that feels natural and smooth but underlying is a material that is much stronger than you'd typically expect. Not entirely metal but still quite durable. It can reduce slashing damage and equalise it better as a blunt force making it harder to cut her but still effective as if she were being hit by a hammer than a sword. As a result of her status as a zanpakuto Masami is able to shift her position in the physical realm and invade a person like a parasite. So long as she doesn't try to interfere too much within the person's soul she can avoid being forced out by the body. This means that it would require the target's inner-spirit (if they had one) to confront her or the target themselves enter their inner-world and confront her there. The body itself can react to her presence if she were trying to interfere with it though such as ripping away souls that a hollow had consumed or attempting to kill someone from the inside. Like a virus she would be subjected to an "immune system" which could harm her and forcefully eject her and ignore any factors such as tier or defence as well since it's not her physical body. Arrancar/Hollows: All the same. A dark mist where there are shades of the souls that were consumed eaten. Shinigami/Vizard: The actual inner-world of the shinigami/vizard etc. Quincy/Sugiura: All the same. A blank white area without any detail. Humans(All): Can be different than the shinigami. Usually in the form of a strong memory within their history. Demons(All): Usually just a black, empty space. Iramasha = Cannot enter them. Note: There may be exceptions depending on the person in question but the RPer can work that out with me. ○ Sealed "Zanpakuto" Ability: Due to her body realistically being also part of her body Masami's sealed ability has spread over her body to apply as though it were an extension of her sword. The exact ability has multiple facets. She is suspended into a perfect state of balance due to her theme of ebb and flow while her duality is in perfect balance. In essence this grants her the ability to completely sustain herself without needing any food or water, she does not even need to breathe either. She doesn't rely on these things to live which is also due to her being a zanpakuto spirit but enforced by her theme. She is immune to energy. The strongest concept in her theme is the motion of energy. The ebb and flow of it. This has the passive effect of bringing any energy-based attack that would connect with her to equal zero. It becomes a balanced force that is neutral and thus ineffective against her. At the same time this is only limited to the flow of supernatural energy. She is not immune to physical force or damage in the way of swords or objects with mass, while this can be incredibly potent as an ability it is only so effective and very conditional on her opponent. An opponent that is heavily reliant on their energy would struggle against her with such means but someone who had zero reliance on it to the point all they did was swing a sword could potentially match her with skill. ○ Shikai Name: Mukushiki [Immaculate Consciousness]. ○ Release Phase: Fall into Place, Mukushiki. ○ Appearance: She does not undergo any physical change aside from her swords holding two different energy colours flowing off the blade. One of her blades have a light blue aura while her other blade is coated in a rich red energy that lingers throughout the duration of the release. ○ Abilities: The entire power of Mukushiki can be divided into two entire aspects and solely these two. The ebb and flow of energy. Both regard the motion of energy in various ways. They represent the concept of yin-yang and duality in the way that Flow is the manipulation of energy external of Masami's body whereas Ebb is directed inwards towards her own internal energy flow. It should be noted that her ability is solely limited to the motion and manipulation. She cannot generate or destroy it. The flow of energy that Mukushiki taps into is spiritual, this means that it leaves the control of physical energy like kinetic, chemical potential and all these physical forces untouched unless they were induced and fuelled by spiritual energy. Masami's ability is very versatile but cannot stray from the two principle themes of her release nor can they be combined. Using ebb Masami is able to control her body energy, an example being releasing an omnidirectional blast from her body or heating it to create heat. On an extreme level she can control her spiritual energy to make herself intangible for an short period (max two posts) that induces a cool-down of three posts after it's stopped. Her external control through flow is much more focused on controlling trajectory of her energy like kido or taking a potent energy attack and spreading it so thin it's negligible before reforming it at a different position and firing again. The applications are wide but the limitations are that it is limited to her own energy that she can manipulate and the law of equivalent exchange applies too. She cannot make an energy attack suddenly stronger just because she's changed its trajectory or anything like that. ○ Bankai Note: I'll submit this at a later date. Until then it's sealed and is also the furthest release form she can access of the shinigami racials due to not having a master to help her get to Shikokai. Comments/Notes: Honestly I really like the backstory of this app. As it shows the progression that separates masami from the typical run-of-the-mill zanpakuto. It ties in well into her personality, in terms of aspirations. You've kept her thematic sound, and centralized. All in all, this is a great application! Also because she is a zanpakuto spirit I will allow her to start out with advanced zanjutsu.